Tell me: who checks off the second box? @nitsua60 I suspect there will be confusion on the part of people in that neck of the woods, no? I mean, they were born in the United States. Unless, by implication, the first box is meant to be read as "these United States," i.e. the 50 states. In which case, where does a DC native check? Q: Where does the bonus feat in the cleric starting package come from? @Shalvenay I would imagine that millions of people living in PR, Guam, USVI, and NMI would be rightly offended by the question, and that the formulation of the question will adversely impact the accuracy of whatever is trying to be counted there. @Shalvenay Yeah... (following) administrative procedure isn't exactly the current administration's strongest suit. 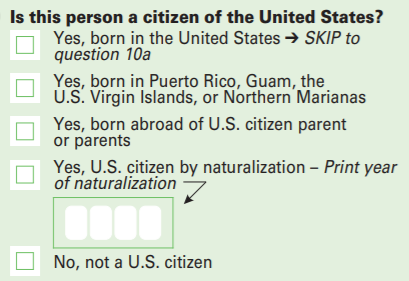 @trogdor I mean, the way I'm reading it it forces you to either say "yes, dammit, I'm born in the US and will skip to question 10A," or say "I guess I have to check the second box and 'admit' that we're not really the US if I want Guam to have its representation." @nitsua60 or if I don't want to get into some kind of weird legal trouble later? maybe? It's not even... politically accurate. @BESW How do you mean? Like, being born on Guam vs being born in California is a distinction without a difference as regards individual citizenship: if I moved to California I would have all the citizenship rights of someone born there. The difference is that while living on Guam I have no federal representation--regardless of whether I was born here. so why exactly do we have to answer any extra questions? But the same check box mentions the NMI. If you're born in the NMI you may or may not be a citizen of the USA depending on when you were born. And what about American Samolia? @BESW Yeah, I noticed them, too. @BESW also, I get that he could get that wrong, but where did he manage to add an l and an I? @BESW Okay, I could have a little sympathy for the last name. I mean, it's bad staff work, 'cause somebody should have gotten him the night before and said "by the way, you might want to practice this one in the shower a few times." But "Samoa"? C'mon, man. but I mean, he was reading it right? Most of us put the accent on the wrong syllable, but there's a Girl Scout cookie by that name, it's not an entirely new word in the mainland. But yeah... a citizenship question asking if you're born on Guam is like asking if you're born on a First Tribes reservation. It's only worth asking if you have NEVER done even the tiniest bit of research. Which, of course, means that's not the question they're actually asking. @trogdor If you see boxes of Caramel deLites, it's basically the same thing. They've got two different bakeries that make the cookies and the bakeries get to decide the specifics of the exact recipe and the name. When the Girl Scouts re-organize their structure, sometimes an area winds up changing which bakery supplies them. Anyone here have Blades in the Dark experience? I'm starting a game soon and would appreciate any tips, but I don't have like, specific questions I could post on Main. @DuckTapeAl I haven't played it, but I've linked a lot of resources about it. @DuckTapeAl -- so, want to hear about how things have been going on game-wise over here? That's pretty cool. How's the DW campaign going? A: If a character has darkvision, can they see through an area of nonmagical darkness filled with lightly obscuring gas? Of course. Every noob knows that darkvision grants visibility through nonmagical darkness filled with semi-diffuse gas. Except on the sabbath. That's different. A: Can a Gnome Ranger use his Animal Companion as a Mount? Q: When a Cleric spontaneously casts a Cure Light Wounds spell, will a Pearl of Power recover the original spell or Cure Light Wounds? Assume a cleric has converted one of their first level spells into cure light wounds, and it was the only spell they have expended. When they use the pearl of power to recover the spell, what is recovered: the original spell, or the cure light wounds? Q: What spells are affected by the size of the caster? @Shalvenay @Glazius Have I read the crystal ball of time zones correctly that we're meant to play in 15 mins? @vicky_molokh Too dense, too interconnected? It worked for me but then I had the author explaining it, which isn't super fair. by the time I get to the close-up explanation, it feels like I lost the thread and am now missing the bigger picture. So far what I got out of it is that I'll want to imitate the regions, stability, resources and upgrades structure in broad strokes. The one thing that doesn't really map to your scenario (probably) is the large amount of initial allies you have. Oh, forging alliances will be of interest on its own. I was looking for any basis of base/civilisation/etc. management that I could adapt. This is probably still the best starting kit I've seen for the system. @vicky_molokh Looks like a really neat game. Just read a synopsis. @KorvinStarmast The ideas are neat, the crunch is . . . unwieldy, at least at first reading. And I come from GURPS, I have done Spaceships and Vehicles, so I'm no stranger to some heavy crunch. But WotA crunch is not particularly heavy, just unwieldy. It doesn't look like it uses the number of pages it has efficiently and readably. @Shalvenay I was most amused at the "he is now wearing a 260 pound cat as a hat" from your leaping from the rock attack last night. CHeck out the post in the journal. @KorvinStarmast how's the reading-over-coffee coming along, by the way? do you mean pirates and dragons? @Shalvenay I liked the pilots do pilot stuff take in the one. I am also glad that nobody died. @Shalvenay yeah, part of why training is so important, and why automation dependency is so deadly. In my opinion, that LionAir crash would not have happened if the crew were encouraged, by their company culture, to disseminate their experience where they had to disengage stab trip and go manual. Culture failure. I refer to the crew before the crash flight. The other problem is the maintenance effort, and why the heck were they not able to reach back to boeing via field service, etc? New bird, should come with a tech support package? Or were they too cheap to buy one? @Shalvenay in as well run an airline as SW, who had a recent labor dispute regarding maint process- if they can have trouble, anyone can, and the LowCost airlines are at higher risk. Hey; just hanging out. It didn't take us one day to figure out how to use a tremorsense spell offensively. You don't want tremorsense anywhere near active ore crushers. Q: How can I kill a tough druid NPC off-scene for the sake of the plot? last edit IMO changed the question significantly (and invalidated the answer) so I reverted it. Maybe some eyes on it would help in case OP reverts back or is confused. > Nailed to the floor. If you succeed with style while attacking with arrows, you can reduce the stress inflicted by 1 to place the boost pinned down on your target. This is something any archer can do, right? Because it looks like a flashy description of a standard rule about SwS on attacks. Well, any archer in a sufficiently cinematic campaign, that is. In a realistic campaign, the boost would be called something else. @BESW I must be misunderstanding something about it then. @vicky_molokh It's in addition to the normal success with style. Lets you double up. Though, if I were writing it now, I wouldn't make it conditional on success with style. @BESW Oh, so you can get two boosts by reducing attack result by 2? Yesterday I actually used the reduction of an attack to get a boost. It was actually a funny way: I had a boost, got a hit by 2, used up a boost to increase it to 4 (SwS), then immediately reduced by 1 to get a newer boost, while also managing to hit the 3-box instead of the 2-box on the enemy. That's the kind of dynamic forward momentum I love in Fate. I remember this dynamic being criticised as very gamist on reddit some time ago. Also, when I declared that this is what I'm doing, nobody understood what was happening from a mechanical PoV at first. So I can see arguments against it. But as a player I feel OK juggling such things. [shrug] GNS is an incomplete and insufficient framework, and juggling boosts forward is a very cinematic concept you can see in every well-choreographed action film. Also, I seem to be putting myself in a misleading position. I meant gamist in a more general-language sense, not in the strict definitions of GNS (which I don't understand well enough to engage in officially correct GNS discussion). The system is designed so that system master and system exploitation is narratively exciting, there's not a mutually exclusive choice. @Rubiksmoose OP posted that revision as a new question, but in a [dnd-5e] context it's almost certaily entirely a matter of opinion. So is that existing question, I think. The community is as usual welcome to override my closure of those questions if it feels strongly about it though, for the record. @Carcer I recall Return of the Scarlet Empress being criticised heavily because how implausibly Sol Invictus was assassinated. I bought my dad an elephant for his room. @doppelgreener I agree with you - as written, both questions are pretty opinion-based. And the newer question is verging on being a bit too broad to be meaningfully answerable as well (i.e. "should a GM be in favour of plot or rules?")... Definitely needs a little refocusing. @Ben Btw, I started Diablo last night (I know I said I wasn't going to - long story). g'day folks. How we all doing? @Miniman odd. The wiki says he doesn't have any resistances? Maybe it was something else? @Ben A different wiki says he's immune to everything. Based on what happened to me, I think it's the latter. @linksassin That is the upside. I'll go back with a bunch of potions and slowly beat him to death, I just wasn't up for it at the time. But it does make me a little concerned about the longterm sustainability of a single player sorc. I mean, I know I can theoretically just ignore monsters I can't kill, but it's not fun to do in practice. [Goes and looks at the spell list] Never mind, golems are a thing in 1. @doppelgreener I definitely agree about the original question. I think Carcer might have a point about how to make it valid, but I'm unsure. I probably should have (thought of and) warned OP about that but my main thoughts were dealing with the incorrect revision rather than the new question at the time. Anyways agree all-around. Thanks for letting me know. @Miniman Jarulf's Guide v 1.62 is as close to authoritative as it gets. @nitsua60 or @doppelgreener, can you mark this question as a duplicate of the one Korvin linked in the comments? Q: What are the barriers to running a published adventure from an earlier edition in the 5e system (assuming that this is possible)? Q: How do I upgrade older D&D adventures to 5th edition? @KorvinStarmast Oooooh. Thank you, that's huge!